FinalFourSuites.com is here to meet all your needs for the biggest event in college basketball. After the frenzy of March Madness, it's down to the Final Four teams. 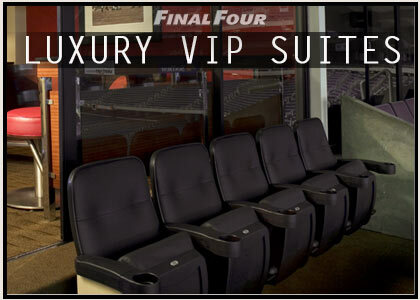 We can provide you with Final Four luxury sky box suites, tickets, and premium hotel packages. We are your elite college basketball and Final Four concierge service. Here is a list of frequently asked questions for your convenience and information. When should I buy Final Four tickets or suites? You definitely do not want to wait when you are buying suites or tickets to the college basketball tournament or championship games. March Madness got its name because how crazy everyone is for college basketball. You need to act quickly. Even before your team wins, you need to get on the phone, and start making arrangements. Most of the games sell out. There is a huge demand for Final Four tickets. All tickets and suites are sold on a first come first served basis. Please call us to discuss the details. Why should I buy from FinalFourSuites.com? Buying from FinalFourSuites.com gives you the confidence in knowing that you are working with the #1 source of Final Four tickets and hotels. We are the industry leader in college basketball tickets. Since the 1980's we have strived to give our customers the very best Final Four experience. All of our services are 100% guaranteed. Our reviews and customer service rating shows us as a dependable, honest, and easy source for all of your Final Four needs. Contact us today. Can you arrange a Suite & Hotel Package for 12 VIPs? We specialize in working with corporate groups, families, and groups of friends who want to purchase a luxury suite or a block of tickets. Through our connections with suite owners and season ticket holders at basketball arenas, we are able to provide the absolute best selection of tickets and suites at the Final Four. We can arrange hotel rooms or luxury hotel suites, and frequently have blocks of rooms available at the top hotels. Skybox suites and lower-level premium tickets for corporate and VIP groups come in a variety of configurations as well. Limo and van transportation service is also available. 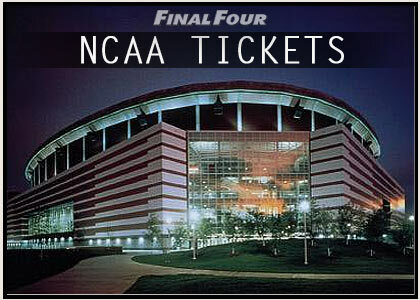 With FinalFourSuites.com, you are dealing with the Final Four tickets leader. How can I be sure my tickets are real? FinalFourSuites.com is one of the most reputable Final Four suites and tickets companies in the market. Our exclusive networks of college basketball suite owners and ticket sellers at basketball arenas across the country, makes us the best source for luxury suites and premium seats at all college basketball venues. We have been selling tickets since the 1980's. All of our services are 100% guaranteed, and we possess an impeccable track record for excellent customer service and satisfaction. We strongly encourage that you call us to discuss any questions or concerns you may have. When do my Final Four tickets get delivered? The majority of Final Four tickets are released only weeks before the event. We will typically FedEx your tickets to you one to three weeks before the game. If we have the tickets in hand, we will send them out the same day. If necessary, we can arrange for your Final Four tickets to be delivered to you at your hotel when you arrive in the host city. It may also be possible to have your tickets waiting for you at the box office. Delivery is NEVER an issue with FinalFourSuites.com. How does FinalFourSuites.com have so many Final Four Hotel Rooms available? Due to the last minute nature of March Madness, fans don't know that they are going to the event until their team wins. FinalFourSuites.com makes a very early investment in large blocks of rooms at host cities, sometimes a year or more in advance. We make these hotel rooms available exclusively to our ticket and suite clientele. We also partner with several of the top national hotel brokerage firms to offer our clients a premium selection of three, four, and five-star hotels and other Final Four championship properties at the best rates. Of course, limo service is available to any of the big games.